The town’s first major development project in 100 years, offering new condominium homes and shopping adjacent to the downtown commuter station. The Township of Cranford in Union County, founded in 1720, has grown up around its train station. When, in 1838, the Elizabethtown and Somerville Railroad made the Township accessible to New York City via train, the railroad led to Cranford’s rapid development as a commuter suburb with a traditional walkable downtown. Yet despite this smart growth foundation, Cranford, like so many New Jersey towns, has had to fight to preserve the vitality of its downtown and the smart growth features of the community from the draining effects of sprawl. Recognizing that development pressures could jeopardize its downtown and the character of its neighborhoods, Cranford has committed itself to careful, comprehensive, well-designed planning. In 2000, Cranford was awarded one of the first Smart Growth grants from the state Department of Community Affairs; the township used the grant to develop a comprehensive Downtown Vision Plan. Some 88 percent of Cranford residents surveyed for the Vision Plan agreed that redevelopment and rehabilitation of the downtown should be a high planning priority. The Vision Plan identifies growth areas and addresses traffic, parking, pedestrian, and public space improvements. This local commitment resulted in Cranford Crossing and a 2003 designation as a Transit Village. The project, conceived by the town, was initially delayed because of a change of developers, but developer Westminster Communities stepped up to the plate, took over the project, and wholeheartedly embraced the mixed-use concept as well as increased the number of residential units in the project from 20 to 50. 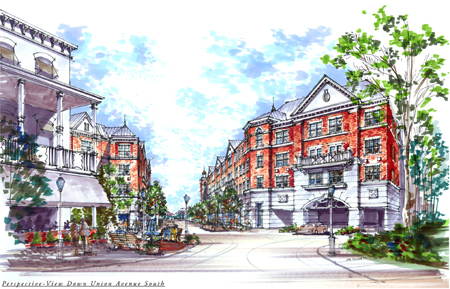 Cranford Crossing is the largest redevelopment project undertaken in Cranford’s downtown in a century and is located in the center of the township’s Special Improvement District (SID). Cranford was the first community in New Jersey, in 1986, to create a SID. The SID provides a source of capital from a special assessment on SID properties for improvements and a Downtown Management Corporation to oversee economic revitalization efforts. The development, currently under construction, will feature 22,000-square-feet of ground-floor retail space and 50 for-sale condominium homes in three- and four-story buildings. In addition, the project will contain Cranford’s first municipally owned parking garage, providing 310 parking spaces to be shared by commuters, shoppers, retailers, and residents. Designed to complement the rich architectural history of Cranford’s downtown, the development also integrates seamlessly into Cranford’s welcoming pedestrian environment. Cranford Crossing is only one block from the train station, keeping in line with Cranford’s history of growth linked to its rail station, which provides easy access to New York City, just 15 miles away. Today the Raritan Valley Line connects the township to Manhattan and Newark, and NJ TRANSIT also offers bus service to Elizabeth, Newark, and the Port Authority bus terminal in Manhattan. Groundbreaking for the $17 million project took place in November 2004; the project is expected to be completed in spring 2006. The project demonstrates Cranford’s and Westminster’s commitment to smart growth and shows that established communities and developers can undertake projects that add vitality and vibrancy, while preserving community character and enhancing quality of life.